Under Georgia law, both parents are expected to provide support for their children. If the parents are divorcing one of the issues their divorce court will consider is that of financial support for their children. Usually the party that houses and cares for the children most of the time (that is, the party with “primary physical custody” of the children) receives money from the other party. The amount of this child support is set by the court using Georgia’s Child Support Guidelines. The Child Support Guidelines perform calculations using information about both parties’ incomes, the child’s needs, and certain special circumstances. The number produced by these calculations is usually the amount that the noncustodial parent must pay, although the court can adjust this amount if it is convinced that a change should be made. The spreadsheets used to make the child support calculations can be found on the website of the Georgia Child Support Commission. By putting your data into one of these spreadsheets you can get a rough idea of how much child support may be for you. Remember, though, that the results can change significantly if someone who is skilled in using these forms finds a way to legitimately include or exclude certain income or expenses. The amount of child support can sometimes be modified. A parent seeking such a change in support must show that circumstances have significantly changed since the amount of child support was set. The court may consider whether the custody arrangement has changed, whether either parent’s income has significantly increased or decreased, or whether the child’s support needs has significantly changed. 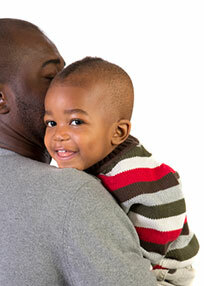 If the parents have never been married, the mother can seek child support from the father through a Paternity action. It is important to remember that once an order is entered requiring a parent to pay child support, the obligation to pay support is enforceable not only by the other parent but also by the court. Further information regarding the enforcement of court orders can be found here.